Gulf Breeze waterfront properties are on four distinct bodies of water; Santa Rosa Sound, Pensacola Bay, numerous bayous, and canals. Three Bayous, Hoffman, Gilmore, and Woodlawn are in the City of Gulf Breeze which is commonly referred to by locals as "Gulf Breeze Proper". Here gorgeous huge oaks line the streets as Spanish moss drapes down providing a serene environment. All of the homes built along these waterways offer spectacular views, and a great deal of them are considered luxury properties and sell more than a million dollars. 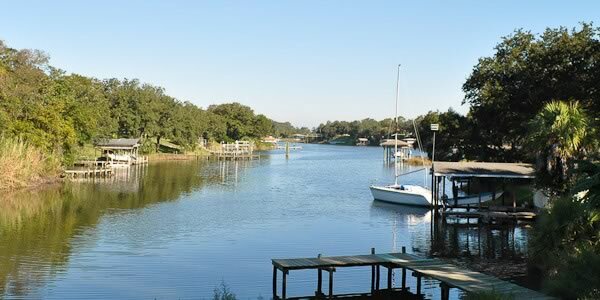 Many homes have private docks, piers and boat houses with lifts. A smaller subset of homes are well suited for owners with large boats with deeper drafts. These homes can also provide easy access to the Gulf. If you would like to schedule a showing for one of the properties below, contact Emerald Coast Realty at 850-437-5618.